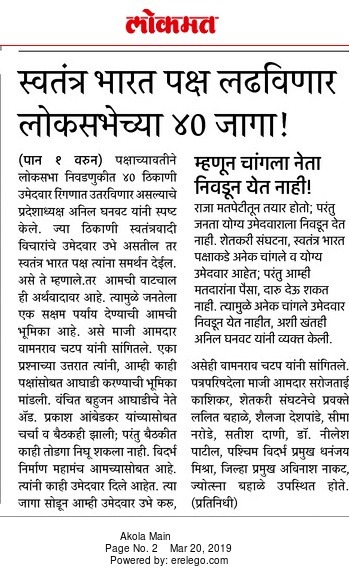 Anil Ghanwat, President of Shetkari Sanghatna, has publicly endorsed Swarna Bharat Party (and Swatantra Bharat Party) for the 2019 Lok Sabha elections. The Sanghatana will not support either UPA or NDA. As the reader may know, Swarna Bharat Party is contesting six seats in the forthcoming elections. The Swatantra Bharat Party has announced that it will contest 40 Lok Sabha seats in Maharashtra (but will not contest the two seats which Swarna Bharat Party is constesting from Maharashtra). There will therefore be over 45 liberal candidates this time. Hopefully a few other parties with broadly liberal approaches will also contest - Swarna Bharat Party is in touch with a few broadly liberal persons. Why are these two separate parties? It may be pointed out that Swarna Bharat Party's manifesto makes intensive use of the original Sharad Joshi manifesto but has significantly improved it to bring new economic policies and improved governance systems to India. Swarna Bharat Party invites Swatantra Bharat Party to review our manifesto and to adopt it (with any jointly agreed amendments) so we can offer a united national liberal party to India. Perhaps actions to move in this direction will occur after these elections.